Project Fledgeling | Please bear with us while we prepare to tear the hinges off of your mind. You may have noticed that I have talked about several different games here. I am attempting to zero in on the concepts that I am exploring; To approach Fledgeling from a variety of angles. 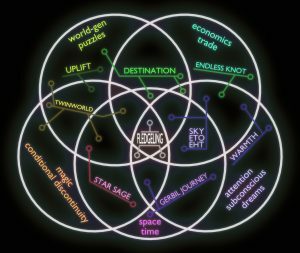 So, quite recently, it occurred that I thought to map out these aspects, and see where each sub-game might lie in relation to the whole. I’m thinking about putting up some more content here, but first I’m wondering if anyone actually reads this stuff. It was started as a rather self-indulgent excercise, and I’ll probably continue it in that vein, but if anyone else is interested, I’d like to know what you come here for. Respond in the comments below, and otherwise, I’ll update when I feel like it! Wherein we read and talk about the lens numbers 75 through 83. Wherein we read and talk about the lens numbers 68 through 74. Wherein we read and talk about the lenses in chapter 11 and 12, lens numbers 41 through 52. Wherein we read and talk about the lenses in chapter 11, lens numbers 30 through 40. Wherein we read and talk about the lenses in chapter ten, numbers 21 through 29. Wherein we introduce the book and talk about lenses one to twenty. 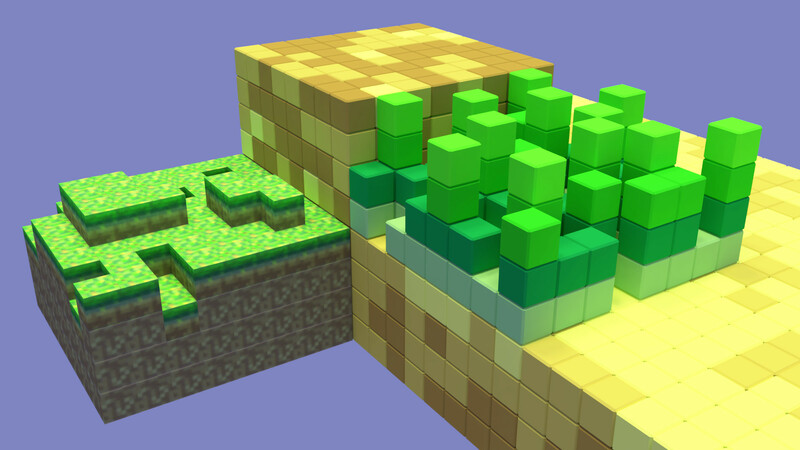 Minecraft uses a single-scale voxel engine, with 1m blocks. The lack of sub-division prevents easily modifying smaller and larger scales. I’d like to talk about artificial scarcity, and how I think it is generally a poor solution. I should begin, though, by an overview of True Scarcity, and its effects on our lives. True Scarcity, like real things have. Resources are scarce, time, energy, materials, space, attention. People throw around “post-scarcity” as an achievable goal, but depending on how you draw the threshold it could have already happened, or it could never happen. Artificial Scarcity has to do with arbitrarily limited things, like CCGs, limited runs, and modern currencies. Mimics True Scarcity in order to reproduce its effects. Can be marginally useful (currency), or deceptive (CCG). I don’t like it. Narrative Scarcity? Resources limited to form a cohesive story (fictional True Scarcity or contrived Artificial Scarcity). Intrinsically artificial in reality (no reason the storyteller can’t solve scarcity by fiat), but percieved as true in context. Mis-used in either direction can lead to story collapse. Artificial scarcity occurs a lot in games, but aside from people being familiar with this way of thinking, and as a tool for exploring true scarcity, I don’t see the advantage. For example, there is (effectively) no marginal cost to distributing DLC to all game owners. Or to releasing all games into the public domain. At the limit, this ties back to the “win” button. Artificially limiting story progression by game performance is… well, artificial scarcity. A “quest” is a stand-in for AI imperative communication. Speculative history of quests. Started with individual goals. Then transitioned to chains (multiple sequential goals), then to laundry lists (paralell goals) (Many small quests can be rolled into one big one). Very few are reactive to player performance and world state. Completing a quest often resets effective world-state. Rewards are generally in-game money, equipment, relationship points (a different form of currency), and experience (which doesn’t make sense, wouldn’t you gain experience based on how well you performed, and what you did, rather than whether you returned to the quest-giver). Could be combined with communication (deceit) and bartering. Certainly need to be more reactive. We see a lot of depictions of starships. Star Trek, Starwars, and countless others. I’d like to teach computers to make starships, and explore the design-space. But to do that, I’d have to know what a starship was in the first place! What is this? Is it really a starship? How can we be sure? So I turned to Jeff Zugale, who recently published Starshipwright One: Science Fiction Spaceships, a collection of 178 of his sketches and renderings, a few of which I have included sections of here as examples, but without permission. Hopefully he doesn’t mind. In perusing the pages, several patterns jumped out at me, which I have cataloged here for your perusal. I’d like to go over the major ones, and offer my own criteria for what it seems like would identify a starship, but apparently doesn’t, as well as what it seems to me is the single defining characteristic. Shamus wrote an article on procedural generation and I figured I’d follow up with a few of my own thoughts. Parametric stuff, rules based design. Random = creators decisions. Controllable = design patterns. The structure of a game sets the stage. The semantics of a game sets the atmosphere. The abilities of players and characters dictate the kind of stories that can be told in-game. Too few abilities stifles expression. Too many abilities stifles creativity. Too few semantics stifles expression. Too many semantics stifles creativity. Too much structure stifles expression. Too little structure stifles creativity. I wish I could recall the fervor of the ideas with which I began this post. Perhaps too much structure. These are all various angles one may hold a game. In order to examine it. In order to evaluate it. Play is the emergent behavior of an intelligence in contact with a healthy balance between the three. Scenarios are the thing you play in Fledgeling. They are, in essence, a “what if” proposition. While the ideaspace holds all the possibilities of the setting, the scenario outlines the particulars. But even though the scenario will limit the actual state of the world, many particulars could be left open in order to offer the player room to customize and experiment. We want to make it easy to design scenarios. Anything not specified in the scenario will be filled in from the “parent” scenario. Infinite time and energy, thinking about things as sub-characters attempt to embody your fancies. Spalling off sub-universes as you speculate on different archetypes. Pausing in slow-motion trying to make a hard decision. While that is happening, a new high-growth crisis emerges (nano-tech fire), overturning the whole point of the decision in the first place. Last time I wrote about the structure of the overall capability arc in Corridor. This time, I’d like to explore some ideas for how to implement Corridor. The player really needs to have input in the game. As much input as possible really. The previous article about AI Assistance in mind, much of this input should be optional as well, but the options should be available. Conflict is only meaningful when the outcome is in question. Often, computer game challenges are against foes who have a noticeably different in-game status from the player character. The player character has depth, while the foes are hardly characters at all. It isn’t even a challenger. It’s just a challenge. Even the most difficult challenges, the “boss” foes, rarely have any out-of-plot motivation, duty, or even activity that they engage in. There are several causes for this (not that it’s any excuse) all of which are more or less surmountable. Character background is difficult to convey and generate. The rise of multi-player direct competition games has illuminated this difficulty even more by demonstrating what happens when player characters to compete against each-other. It doesn’t mean anything to challenge a non-entity, nor does it signify to crush an inferior. “Boss” characters are often meant as a game-play challenge, but as they are presented as characters, they often fail on that merit. Reducing the player’s character to the level of other in-game characters is important for verisimilitude. Giving the player special powers makes them special, but also adds exceptional expectations which can often not be met. The player should compete against evenly matched foes. Whether this is symmetrical or not, there must be a balance of forces or there is no need for contest. games are not stories, but they do need momentum. History building up to the point of interaction. NPCs and environment needs to support this momentum. Good manuverability (high player agency) in the narrative trajectory. Balance between the two, if too much manuverability then history means nothing. If too much momentum then the player’s choices don’t matter. Many games neither justify the player’s character’s actions, nor give them options to make real choices. What you want, what you can do, or what you have. Which is more important? Each informs the other. Each is superior to the others. Each serves the others. They all work together. Where did these ideas come from? Some are seeds which spawned concepts, others are examples of where these same ideas have cropped up independently. Life: Most things, including deep nesting. I attribute most of the independent consensus to this aspect. Revelation: The book in the Bible. Axies of merit and paralell spiritual hierarchies. Dungeon Siege: Linked limitless spatial nodes. Megatokyo: PCs with emotional stats and independent behavior. A Fire Upon the Deep: Vast scope fiction and data-intense societal development. D&D and GURPS: role playing games (a mixture of positive and negative examples in both). StarTrek Enterprise Floorplans: Vessels really can be fleshed out internally. Dwarf Fortress: Lots of deep and broad world simulation. Taking over historical characters, etc. Nodes, connected by straight lines (curves possible?). Pieces move one space at a time, simultaneous movement for all teams. Each piece has a momentum vector. Movement takes 1 momentum (plus vector effects). Pieces colliding zero momentum for both, higher momentum makes the move, lower momentum is removed from the game. Targeted mostly at AAA FPS titles. They treat you like you are an idiot. Hand-holding, QTE, omniscient mini-map, lack of fast travel. They are too focused on realistic graphics. This is a game about procedurally generating corridors. Two big questions: Is this game worth making? Can this team make it? * Asking the publisher to design the game. * IP-focused game without rights to IP. You may have noticed a recent drought of content for this blog. There’s a number of reasons for that, but the most pressing is that no one is paying us to do this, so we do it whenever we feel like. So, how do we get paid to work on Fledgeling? We could just take donations, but they don’t work well. Patronage is just regular donations, and this model hasn’t worked well for us either. At least, not so far. Terestrial plants grow from seeds. A seed is a concentrated bit of building materials, energy, and instructions that is missing one thing… water. In fact, water is the critical component which allows seeds to flourish. There are also factors such as temperature, air, and light. Uplift is a toy-box. Each of the components can be thought of as a toy from a compatible set. But it is also software, and some things rely on other things in order to function. Trees, for instance, need water to live. If you tried to play with trees without the concept of water, you wouldn’t get very far. Tada! … Maybe it’s still not obvious what is going on here? Yeah, I don’t really know either. 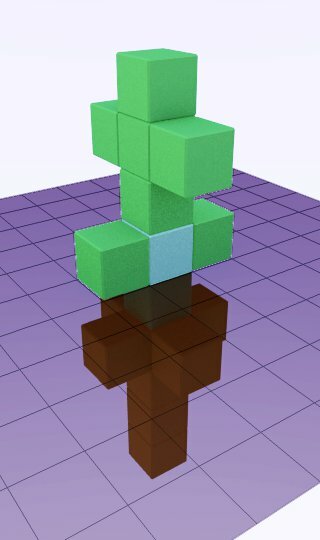 In order to simultaneously provide toy-box freedom alongside robust dependency visualization, while staying true to the nested voxel presentation, I decided to structure the component dependencies such that they form a voxel structure. Each block relies on all of the blocks beneath it. 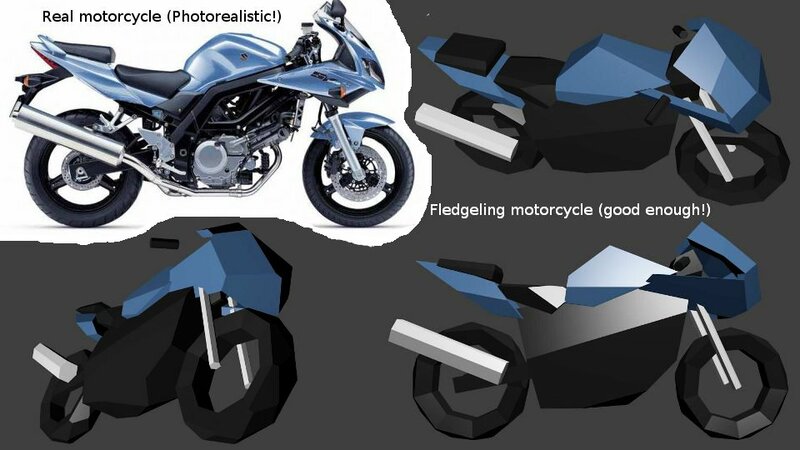 Being based on a grid, Uplift shares many qualities with volumetric numeric analysis techniques. It is, in fact, designed this way. I love procedural content generation. I enjoy Minecraft, and contributed to its development. It’s a fun… Game? Toy? Software? Minecraft is a fun software. So, let’s talk keyboards. Specifically keyboards as game controllers. I appreciate Keith Burgun’s work on defining the word “game” (See this post for a good outline. 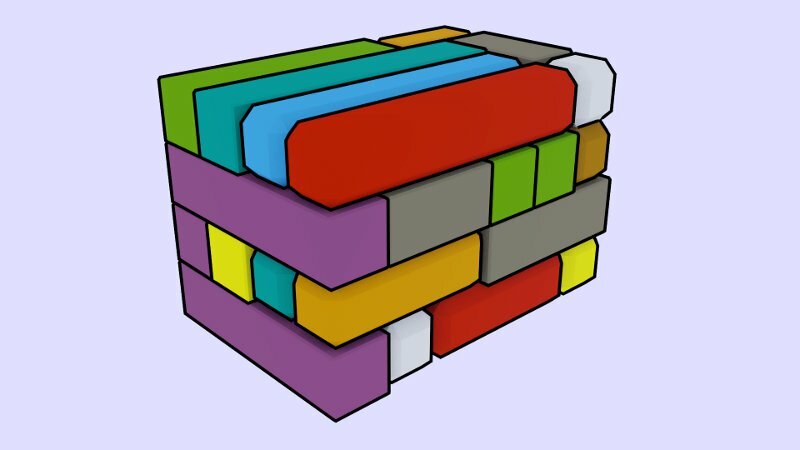 To summarize, KB defines games in terms of the layered context “Toy, Puzzle, Contest, Game” where each successive element is a sub-set of the last) but I have arrived at a slightly different objective space and corresponding terminology. I’ve addressed this topic informally already, (and the topic of the definition of game even more informally) but it bears a more thorough look. In short: Games are active models designed to allow the user to cheaply learn important information about costly systems. Minecraft is a proven product. Fledgeling is a distant dream. Somewhere between Fledgeling and Minecraft, Uplift juts, jaggedly jousting juxtaposition. How much can be accomplished in a breath? A day? A lifetime? What can be done with a grain of sand, a brick, or a mountain? What is it like to be a tuft of grass, a bug, a crystal, or an avalanche? Could intelligent rabbits build a civilization? All these questions and more, I intend to explore in Uplift. Working on a game concept: codename Uplift. Where did the name “Uplift” come from? There are a few reasons, that make sense. One of the main mechanics is lifting large blocks of stone and earth. It involves elevating unintelligent creatures to intelligence, technology, and civilization. It is intended as a step between Minecraft and Fledgeling, an attempt to raise the expectations of gamers without attempting any mind-breaking leaps. In the case of the people talking, it seems that the surrounding nodes would need to broadcast their shatter conditions so that the node’s currently being simulated know what factors to calculate… Perhaps even, the only factors that need to be simulated are those that relate to shatter points of surrounding nodes… Like sarcasm, its not even thought about (thus not simulated) amongst those who don’t care. Has this been thought about already? We’ve talked about how not to do graphics, how to not make them overly complex or deceptive. But visuals are important to games, especially as a communication channel. Here are some examples of what we expect the visuals to look like in Fledgeling. A simplified motorcycle model, displaying the primary functional groups. If you’re interested, here’s the raw live recording with an extra twenty minutes of random chatter and dropping calls. NOTE: The following is a dialog between a couple of friends of mine. I’ve talked with “A” extensively on the topic of Fledgeling, and he’s probably the world’s leading expert at this point (Certainly above me. I may be a “visionary”, but half the time I can’t concoct two clauses to rub against each-other). Participant “Q” is also an old friend, and a vetran of industry-critical software development, as well as high traffic web design. The dialogue has been edited for clarity, and I have inserted notes where appropriate to offer clarification. On the whole, I find this discussion fascinating and enlightening, and I hope you do as well. Enjoy! Q: Do you think the whole “glorified social experience” is just a sort of fad that might pass? Or do you think games will continually develop that way? What is an AAA Game? My dad is a salesman, and works from home fairly frequently. When we were little, he used to walk by while we were watching movies, on his way to or from his home office. We had a fairly small library of shows, so we re-watched them with fair regularity. I recall him asking with alacrity, “How’s it going to end this time?” It became a running joke. Fledgeling will likely have an “unconscious layer” of information. Things the player can not view or directly change, but nevertheless influences the player character’s actions. Unlike most games, the player’s control over their character will be tenuous at best. Most of the necessary functions required for efficient functioning are trivial and unimportant for conscious decision. The player controls the character, by which we mean the character’s major decisions. But for everything else the character relies, to a great degree, on the subconcious. The perception layer (in my terminology (which is what I use to communicate)) is an intermediary between reality and memory. It models the fact that, when you perceive something, your perception doesn’t always match what’s really there. In fact, it never matches it perfectly. Occasionally, perception and reality are far divergent. I think of the perception layer as a piece of glass. If it is smooth and clean, you can look through it easily. If the glass is clouded, painted, or covered in dirt, your perception is going to be obstructed. Even worse, if the glass is uneven, warped, or otherwise malformed it can give a clear but distorted view of the other side. What language will Fledgeling speak? My Daughter’s Storybook, and What Griefs Came of It. My daughter came up to me with a book. It’s one of those “books” with four pages, entirely fabricated from impact rated cardboard and primary color paint. Within is depicted a house (Along with what seems to be a completely random assortment of other objects. A dog, a tire, a pond, what is this? It should be titled “A Child’s Guide to Pastoral Free Association”… But I digress.) with a front door, a couple windows, a roof. Common fare. If you do A and B then you can try doing C. Oh, but you have to do A and B every time you want to do C. No, you can’t skip those parts. It’s core gameplay! Seriously, what’s the deal with this? Can’t I prove to you that I’m capable of these tasks? I mean, collect some statistics on my performance or something. Even degrade it by 10%, or 50% for that matter, just let me use MY performance for the “auto calculate” instead of the developer’s expectations or the AI’s abilities. A couple of weeks ago, dudecon introduced me to Kerbal Space Program, an in-development “space program” simulator. Since then, I’ve started getting up early to squeeze in an hour or so of play in the mornings, played at home, played at work, and spent no less than 20 hours developing a Python script to parse the game files to do out-of-game “rocket science” analyses on parts and spacecraft. You don’t know me very well, so in case I’ve not made it clear: I think this game is a ton of fun. You are going to need some imagination to enjoy Fledgeling. It won’t be all in your head (or will it?) but just like a lot of other games the presentation and interface only tell you enough to get you started. You have to (get to?) fill in the blanks yourself. If it explains how it won, then you’ve just made a self-updating tutorial and walkthru. If you can choose which part of the game it works on, then you’ve just implemented a “skip this annoying/frustrating part” button. A game can not be (and indeed should not be) a perfect copy of real life. Some things are different (fantasy), but most are simplified. This is good. We play games, in part, to escape from the complexity of normal life and focus on a few relevant details. We desire to fit the whole problem in our heads, and most of us have heads too small for the real world. I love a beautiful expression. Many others prefer a beautiful experience. Both are necessary. Expression is moving something inside outward, pouring out what is already in the soul. Experience is drawing something outside inward, lapping up the un-self into the self. Of course, rarely does one exist without the other. We experience our own expressions, and modify them even as they are pronounced. We respond to our own experiences, and express our reactions even during the event. Experience and expression each chase the other. One leads, and then doubles back, chasing the first; This recursive cycle feeds on both the other and the self, and can quickly lead to surprising places. I’m an avid open source software user and would-be contributor and a Linux user. Software patents seem completely backwards to me, and I’m a strong proponent of open source licensing. That said, I think open source is generally wrong for games. This is one of those older games. We played it quite a bit (my brothers, friends, and myself) when we were younger. It’s a “classic 4X” turn based game with a good bit of depth and variation. I haven’t played it in years (and years) now, but here’s what I recall. Nostalgia Warning! My memories of the game may depart vastly from the game itself. This game may actually be much less interesting and enjoyable than I recall. Fledgeling is super huge. Everything from the firmament to the flagella is in there. So how do you handle all of that stuff? Your mind is a complicated set of interconnected ideas, which are themselves interconnected ideas. As far as you know these ideas are insulated from “reality” and have no direct bearing on anything that “actually exists”. A Game Master, in a free-form role playing game, fulfills a variety of roles. The players in such a game “play the role” of variously limited creatures, usually individuals. One could sum up the GM’s role as “the Game Master plays the role of God”… but that’s too easy! What does God do? What are God’s duties? Things come in different sizes. That’s the premise here. A given. Most games deal at least a little with scale imbalance. Fledgeling will deal with objects and organizations on vastly different scales. But what does it mean that something is bigger or smaller? Does size really matter as much as we think? Can a difference in size amount to a difference in kind? I would say, respectively: Larger things are more difficult to work with, but also more useful. Not really. No. A single set of flexible rules should be able to account for the behavior of large and small alike. No wait, let me explain! I like my games iconic and clean. I don’t want a cinematic experience, I want to be challenged. If you love the fancy eye feast offered by modern games, that’s great… and you should probably skip this article. Chess and Dwarf Fortress are more my style. So, that’s where I’m coming from; That’s also where I’m going. Everyone thinks that their ideas are the best. No one thinks they are crazy. Yes, we can all admit we were wrong from time to time, but people don’t actively hold beliefs they know are false. We have (and must have) a confidence in our own ability to reliably perceive and interpret the universe. Some games are fully chance based. Some games are fully skill based. But some games are both, and life is like this too. The problem is when one is disguised as the other. Often chance is disguised as skill, to make the player try to figure out how to do better. The other case, where skill is disguised as chance, is far rarer. Fledgeling is a numeric role playing framework with integrated Simulated Intelligence and nested fractal structure. Fledgeling is a computer game. Sort of. It is also a game engine.The TableTop RPG analogy is probably the best. Fledgeling is an attempt to fabricate a computer program that can act as both mediator and storyteller, with the ability to adapt to player actions. So basically we’re trying to make an AI DM. The overview page says the same thing in more words. Games are all about conflict. Whether it is conflict between separate players, or between players and the game’s rules, there is a tension of desires. Someone wants what they do not have. Often, it is something that someone else has (see all zero sum games). Without conflict of some sort, there is no game. Even the most peaceful and creative of games embody this axiom. Materials vary. Situations vary. History, performance, results may vary. Whenever you know something, or see something, or remember something, or do something you’re experiencing a bit of slop. Nothing is mathematically certain. This is one of the reasons games of chance are so attractive to us. We deal with small randomness all the time, and bringing it out into the open and freely admitting “I have no idea how this will turn out” is satisfying in a way. We hide and ignore the randomness in so many other situations that letting it out feels right. “It’s about time” we seem to say. 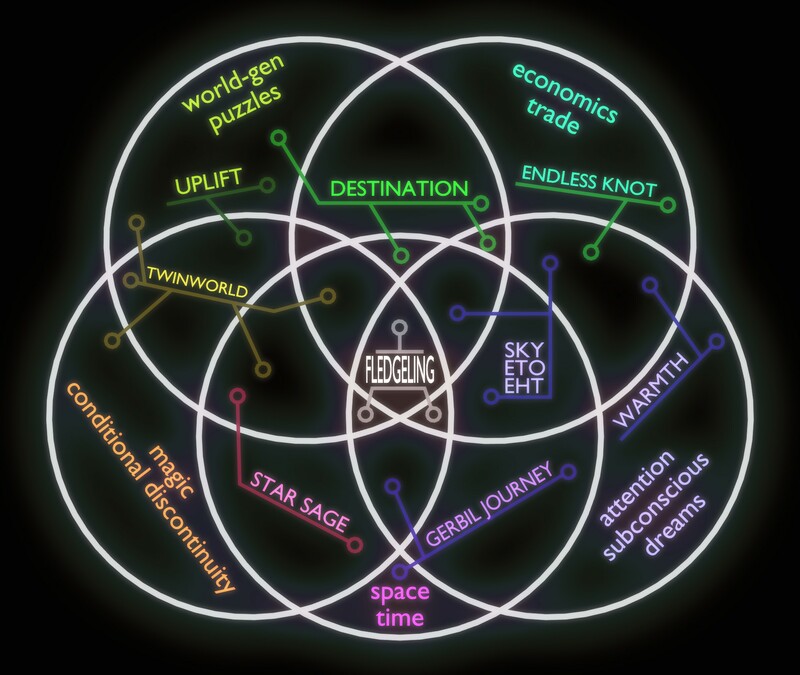 Fledgeling is, at its core, a game about your mind. No, not the character’s mind, the player’s mind. The mind that is reading this sentence right now. Your mind is dumb. I want to build you a better one. Construct something new with the rubble that is left, once you have seen what I have seen. Oh? Your “sanity” is strong? Perhaps it is. Perhaps it will withstand the blows, the rocking shift beneath your feet, as the soil turns to sea. Can your philosophy survive at twenty thousand feet underwater? Perhaps it will. You may be blind to the implications. Perhaps, both unseeing and unhearing (or lashed upon the mast) you will sail past the sirens. You could come, unaltered, to familiar soil, and eat the same bread you ate before. But then, if Fledgeling does not change you, why would you play at all? We long, with good reason, for things to make sense. I recall my frustration with Fable when, upon finally reaching Snowspire Village, everyone speaks a totally understandable language. Plus, even though they have been out of contact with everyone else for “a long time” it’s no big deal when a foreigner arrives and re-opens the Cullis Gate. And where have they been getting food all this time? And clothes? Why haven’t they all starved to death? It just made no sense at all. Hey all, I’m Dru. I’m a father, an engineer, and an all-around nerd. I play role playing games on computers and around tables and enjoy reading and writing good and terrible sci-fi, respectively. Among the things that may be relevant to know about me is that I tend think way too much about a lot of things. So, naturally, I’ve applied principles from rocket science, engineering, and economics to the implications of starship design and power generation in Star Wars. In general, most of the numbers that I present here are induced from data presented by Brian Young in his Turbolaser Commentaries. I’ve assumed the Star Destroyer (and similarly classed ships) to be a baseline for median power generation technology, as they are a mass-produced technology and the books and movies present examples both more and less powerful with consistency. Another point of clarification: the numbers I present are “big order of magnitude” numbers. Densities are calculated based on order of magnitude power and order of magnitude volumes, which in turn are calculated from order of magnitude data or length, etc. Let’s talk about “The Metaverse”. What is it? Why is it desirable? Who cares? Sure, you can look it up on Wikipedia, but here’s the digested version. … which means that games are based on reality. Well, okay, someone’s imagination of reality. A game (computer games included) is a way to explore experience. What is it like to lead an army? Chess can answer that, to a point. A game is a kind of metaphor. It is a tool to find the ways in which complicated things can be made simple, and simple things made complex. I really can’t say enough good things about this game. I’ve already written about the experience elsewhere, so I’ll try to stick to seeing SpaceChem from the game designer’s perspective. Travel is a common mechanic in nearly every game. Moving pieces in space is a powerful symbol for changing the state of a system. Walking is a familiar experience, and draws us into the game world. If the AI is better at this game than I am, why don’t I just let the AI play on my team? Oh, right, because it’s supposed to be “fun” to do this myself. The thing is, I’d love to delegate stuff to the computer. Maybe not everything, but, well, here are some examples.